Marvin Gaye made those three words famous in a 1970 song that cried out against war, poverty and discrimination at home and abroad. For West Linn resident Eliza Jane Schneider — who, as an accomplished voice actor and dialectologist, knows how easily words can be twisted and tangled depending on context, tone and personal experiences — "What's going on?" has become something of a universal key into the minds of those she's met throughout the world. She'd ask the question to people on the streets — in America and other countries like Nigeria, Ireland, China and New Zealand — as part of an effort to document all of the dialects of spoken English in the world. Since Schneider started the project 25 years ago, it has evolved into something far greater. Because when you ask someone that simple question, you never know what the response will be. "It's given me this incredible perspective on what's important to people," Schneider said. "It's usually very different than how they're represented." Schneider aims to capture these stories in a one-woman show, "displaced/detained/discovered," that debuts Jan. 25 at Robinwood Station as part of Portland's Fertile Ground Festival of New Works, a multi-day event featuring locally created theater works. The show is an update of a previous production Schneider premiered two years ago in North Portland. Told through the eyes of a busker (street entertainer) and inspired by Schneider's real-life experiences, the show depicts a woman trying to reckon with her place in a harsh and relentless world. 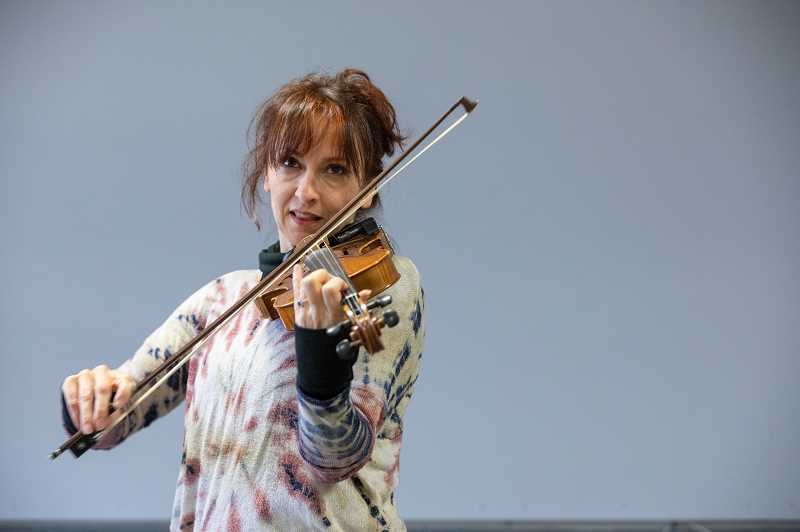 "Armed with only a violin and a guitar to soothe the world's displaced, and ultimately herself, she asks the question: 'How do you navigate a world in which you must close your eyes in order to stay sane?'" reads a description on the Fertile Ground website. 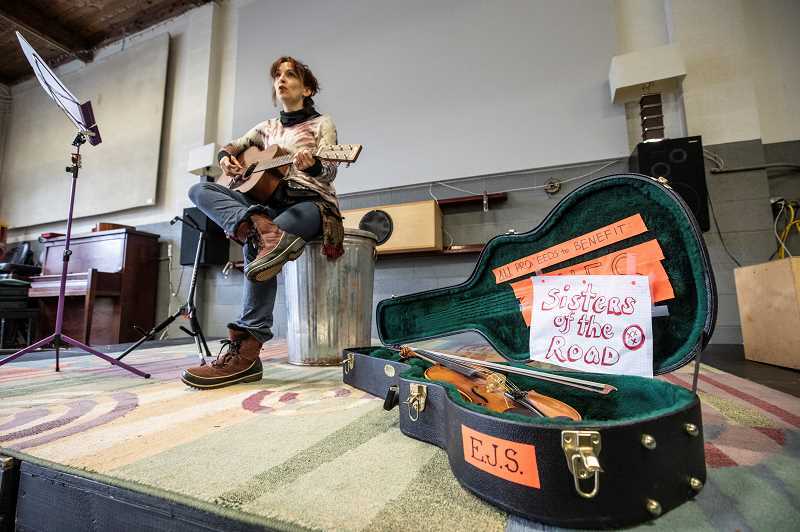 Throughout the production Schneider tells the stories of the "displaced" people she's met during her travels, using both spoken word and musical pieces. The play ends with the words of Latina mothers who are locked inside an Immigration and Customs Enforcement (ICE) building. 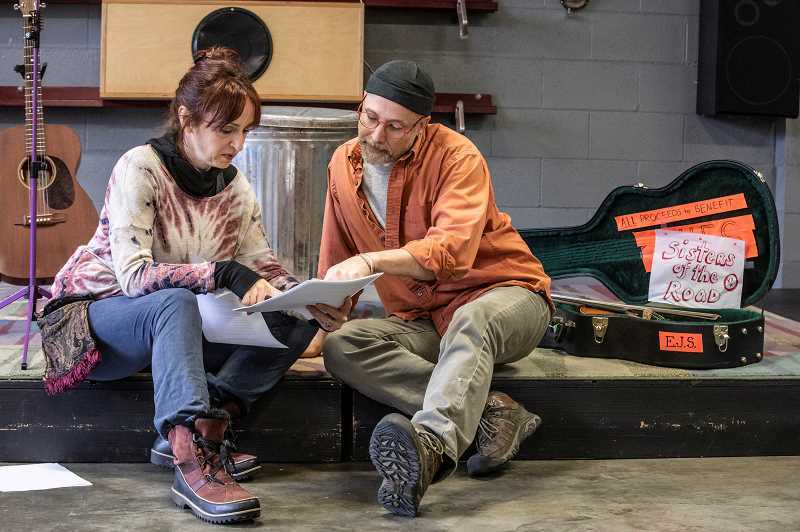 While Schneider performs alone — at a recent rehearsal, she perched atop a trash can onstage while bouncing seamlessly between accents and violin pieces — she developed the show with director Bruce Hostetler. "For me, this is unique in that this is a real relationship of writing," said Hostetler, the founder of Compass Repertory in Portland. "The other stuff that I write, it's just me sitting there with my computer trying to figure out what I want to write. This is actually more fun." Schneider and Hostetler had an easy chemistry as they workshopped the latest version of the script, laughing as they reorganized dialogue. For Schneider, Hostetler has been an invaluable resource since they started working together two-and-a-half years ago. "It's impossible for me to have that kind of perspective, and he's got this great perspective." Schneider's prolific travels might paint the picture of a wanderer, but she's also had a celebrated career in voice acting at home in the United States. She was the voice of eight recurring characters — including Wendy, Shelly and Mrs. Cartman — on the popular animated series "South Park," and also created characters for the "King of the Hill" series and Pixar's "Finding Nemo." While Schneider found success as a television actress early on — she moved from upstate New York to Hollywood at 18 — she felt the experience to be frustratingly unbalanced. "I felt disconnected," she said. "Because you're in this room and everybody's looking at you. You're projected into the homes of children all around the world who you can't see, but they can see you. It's an unexpectedly isolating experience." From this frustration, the idea to travel and record dialects was born. In 1993, Schneider bought an old ambulance and set off across the United States. "I don't even think I knew why I wanted to do it," she said. "My excuse was going out and studying dialects, because at the time there was no existing source material for actors other than someone imitating people from everywhere. And this was before the internet, so I wanted to go out and collect all the dialects of spoken English in America and the world." She traveled as far as Maine during her first trip, but as she drove back — she was due for voice looping on a children's show called "Beakman's World" — Schneider realized she had much more work to do. "I passed the Ozarks and I passed the Navajo and I passed Mormons and I was like, 'Oh my God, there's these whole swaths of America that I completely missed. I've gotta come back out,'" she said. "And that was pretty much what kept happening." The quest continued through 2017, when Schneider traveled to Singapore. "(It) was the last English-speaking country, where English was the first language, in the world that I had yet to go personally and record people," she said. Over time, Schneider came to realize it was impossible to separate the sound of a voice from the story it was telling — and that's the ethos behind "displaced/detained/discovered." "I tried scientifically to break it all down and do it that way as an actor — to study the sounds of voices, these dialects," Schneider said. "But ultimately what I got was ... these indelible impressions of what their yearnings are, and the humanity." "If there's any kind of thing I want people to walk away with, it's this idea that attention is really valuable," Hostetler added. "Where we decide to focus our attention is incredibly valuable. My attention is really valuable, and if I choose to give it to somebody who doesn't get much attention, that's a valuable thing." Schneider and Hostetler saw that firsthand when they performed the earlier iteration of the play in North Portland two years ago. "We actually had a lot of people who were experiencing homelessness at those shows, and we had some amazing conversations afterwards," Hostetler said. "It's going to change (at Robinwood Station) ... but it's still going to be a really good conversation. It doesn't have to have that particular audience in order to have a good conversation." Friends of Robinwood Station President Randall Fastabend had a similar goal in mind when he booked the play, which will be the community center's first foray into live theater. "I'm staunchly a proponent of the station being an entity that is positive and trying to help situations and find solutions," Fastabend said. "I'm glad to be part of this show that possibly could bring more awareness to the situation of homelessness, and searching for answers." That overarching question — "What's going on?" — is easy to avoid. Indeed, life might be easier without asking it. But Schneider and Hostetler hope the play will inspire others to make the more difficult choice of opening their eyes and ears. "A lot of us feel like we can't solve the problems, so we stop looking," Hostetler said. "We don't want to look, because to look is to care, and to care is to want to do something. ... How do you navigate a world where you have to keep your eyes closed in order to stay sane?" You can start by asking one simple question. When: Jan. 25, 26, 31, Feb. 1, 2 at 7:30 p.m.; Jan. 27 at 2 p.m.
Tickets: $20 ($10 for students/seniors), available at fertilegroundpdx.org. Several performances will also boast food donated by local businesses, including La Fiesta on opening night, Ying Bun Jan. 27, One Hope Wine Jan. 31 and Thai Lemon Feb. 2. There will also be a silent auction with gift certificates for Linn City Pub, Edible Creations and Cask N Keg Public House.